PAUL BISHOP ~ WRITER: FIGHT CARD AND THE WORLD OF LUCHA LIBRE! FIGHT CARD AND THE WORLD OF LUCHA LIBRE! When most people think pro wrestling, they think America. Hulk Hogan. Stone Cold Steve Austin. The Rock. But there is great wrestling from around the world…Japan, Canada, Germany, and many other countries…Each with its own unique style and fans. Among these unique forms, none is more dramatic and insane then that of the world of Lucha Libre in Mexico. Growing up in the Great White North, I didn’t catch too much of this world. Like most of my American peers, my TV was dominated with American and Canadian wrestlers. However, down Mexico way there was a secret world of masked wrestlers -- and they were heroes! North of the border, masked men were almost always villains – hiding their identity. Many were out of shape, has-been grapplers who needed a paycheck – yeah, I’m looking at you, Spoiler II. However, in the world of Mexican Lucha Libre wrestling, masked men were (and continue to be) the stars who crush the no-mask rudo villains into the mat. They use high flying moves and ring gymnastics, which defied physics, and many believe (truly believe) these heroes have been granted magic powers. Luchadors like Santo and Blue Demon were modern folk legends, with piles of great B-movies where they fight gangsters, monsters, and communists. I originally read about them in smelly newsprint magazines with glossy covers, wishing I could see these titans from Mexico on the screen. Rise of the Luchador is my attempt to make an old wish come true, the wish of a kid who only got to see the descendants of great luchadors in America. I’m best known for writing novels with wrestlers in them (Death Match) or street fighters (Blood and Sawdust), but I really wanted to write about the tension between these two worlds of shoots (real fights) and works (scripted bouts). Real combat arts are about predation, survival, and dominance. They are practiced by those who want to see who is best at crippling the other guy. Wrestling is the reverse. It went from being a combat art, to a con-game, and then to an art form – telling stories with pretend violence that relies on massive amounts of cooperation. I could think of no bigger pressure cooker to put our street-fighting hero Carlos in than a wrestling ring. The result is pure dynamite. 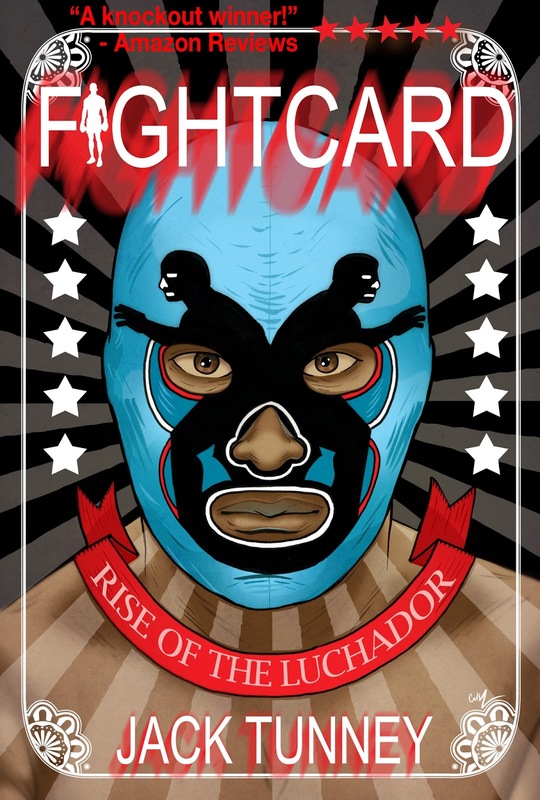 Hope you enjoy my addition to the Fight Card saga – Rise of the Luchador!